CHARLOTTESVILLE, Va., March 22, 2019 /Christian Newswire/ -- Robert (Bob) V. Finley, who led a reformation in foreign missions and founded International Students, Inc. (ISI) and Christian Aid Mission, departed to be with Christ his Saviour on March 22, 2019, at the age of 96. Born in Albemarle County, Virginia, Finley attended the University of Virginia where he served as undergraduate student body president, head of the Honor Committee, captain of the boxing team, and won the NCAA intercollegiate boxing championship in the middleweight division in 1944. At the time of his graduation that year, Finley was recruited as an evangelist by Youth for Christ and InterVarsity Christian Fellowship. Between 1945 and 1947, Finley spoke in universities, seminaries, Bible institutes, and churches throughout the United States and often shared the platform in large youth rallies with Billy Graham. 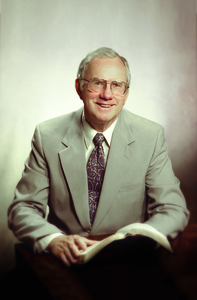 Finley is fondly remembered by missionaries worldwide for his life and work, his books, articles, and his teaching. He believed that it is the supreme responsibility of the disciples of our Lord Jesus Christ to plant and build His church among all nations. "His character, knowledge of the Bible, and focus on the Great Commission have shaped my life, the lives of those who have worked alongside him in ministry, as well as hundreds of missionary leaders from overseas," said his wife Cynthia Finley. Along with his wife, Finley is survived by two daughters, Deborah Finley Arcieri and Ruth Finley Cassidy, three grandchildren, one great-grandchild, and two sisters. Christian Aid Mission seeks to establish a witness for Christ in every nation by assisting indigenous ministries based in areas of poverty and persecution, giving priority to ministries sharing the gospel of Jesus Christ with unreached people groups. To learn more about Christian Aid Mission, visit our website www.christianaid.org.